Tag Archive | "Melanotaenia boesemani"
Boeseman’s Rainbowfish (Melanotaenia boesemani) are found in the Vogelkop Peninsula of Western New Guinea (formerly Irian Jaya) in the tributaries of Lakes Ayamaru, Hain, and Aitinjo where they inhabit densely vegetated, swampy shallow areas and feed on small insects, aquatic crustaceans, and some vegetation. 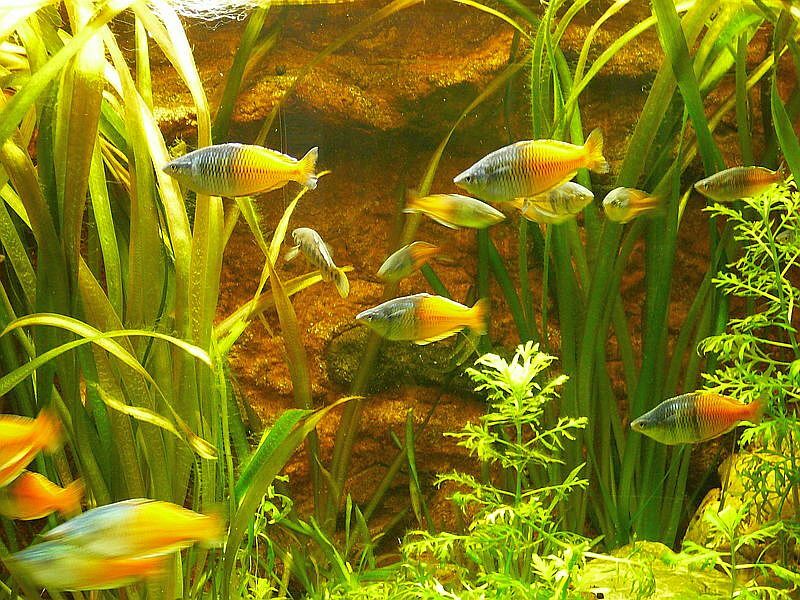 Tropical fish keeping enthusiasts also know Boeseman’s Rainbowfish as the Bicolor Rainbow fish, Bicolor Rainbow, and Boesemani Rainbowfish. 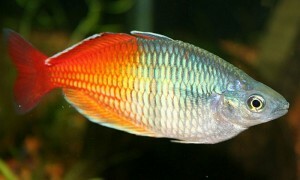 The Boeseman’s Rainbowfish has the typical rainbow fish shape. They are long, deep bodied, with an arched back, two dorsal fins, a narrow head and relatively large eyes. 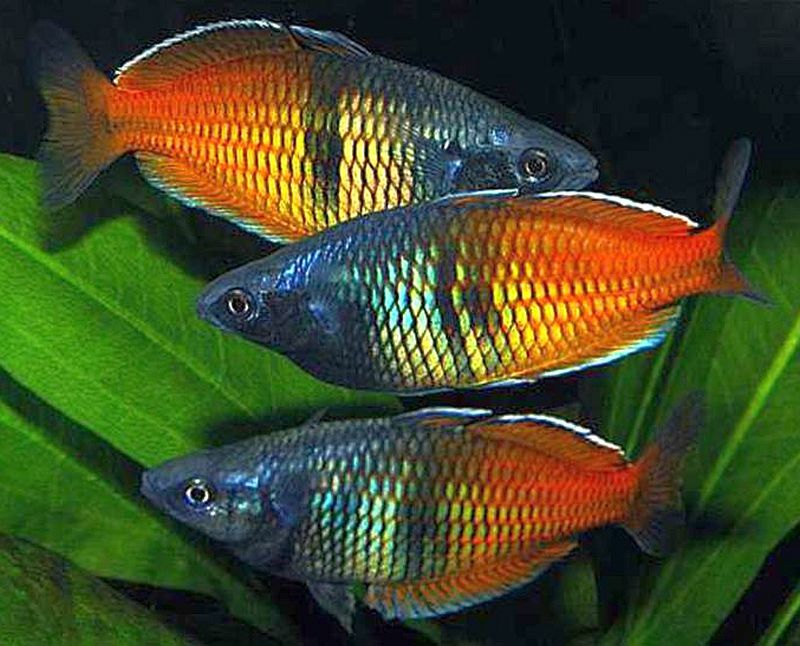 Wild caught and correctly bred Boeseman’s Rainbowfish have intense colors that make them a popular choice for large single species or community aquariums. The back half of the males are a fiery red with orange and yellow highlights. The front half of the fish is a deep indigo blue or purple color. The two colors intersect in the middle of the body with a few green to blackish vertical stripes. The fins are generally opaque and yellow, outlined in white. At a length of about 2 1/2″ the fish begin to develop their characteristic colors which grow more vivid as they age. Like other rainbowfish, Melanotaenia boesemani display different color intensities and color variations that are dependent on where they are collected from. Genetics, age, water quality, food, health and other factors all have an impact on their colors. Female Boeseman’s Rainbowfish are basically the same color as the males but with more silver in the body. They are also more drab than males of the species. Male Boeseman’s Rainbowfish will grow to 4.5 ” in length while females max out at about 4″. At around 2.5 inches in length, these fish will begin to develop their beautiful characteristic colors. Like most rainbowfish species, Boeseman’s Rainbowfish are most at home in a densely planted aquarium with a sandy or fine gravel substrate, some driftwood and plenty of swimming space. They like clean, hard, alkaline conditions with moderate water movement. Because of their size and the fact that they are active almost all of the time, they should be housed in at least a 30 gallon aquarium, but a 55 gallon or larger is preferable. Boeseman’s Rainbowfish are schooling fish and should be kept with at least 6 or more of their own kind with an equal male to female ratio if possible to bring out the most of their colors. They are fine in community aquariums with like sized, fast moving species but do best in a biotope setting that mimics their natural habitat with other rainbow fish. 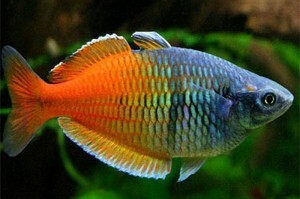 Boeseman’s Rainbowfish are moderately easy to breed. Set up a long breeding tank with a sponge filer and a spawning mop or a bunch of fine leaved plants for them to deposit their eggs on. Select a healthy pair and condition them with protein rich live and vegetable based foods until the female has produced eggs and is ready to spawn. The male will lead the female to a spawning site where several eggs will be laid on the plants or the spawning mop and fertilization occurs. The spawning procedure will be repeated for a few days with fewer eggs being laid at each session until spawning is completed. Most breeders insure that the fry are not eaten by the parents by removing the eggs to a rearing tank with an air driven sponge filter. At 72 degrees, the eggs will normally hatch within a week and the fry will be free swimming 24 hours later. Feed the fry infusoria or liquid foods until they are able to eat newly hatched baby brine shrimp , or daphnia which usually takes about a couple of weeks. The fry grow slowly and until they are about two months old need a lot of care. Clean water is essental in the rearing tank. Do not crossbreed rainbowfish. In the wild they will not interbreed with other species however, in an aquarium environment they frequently do so. Unfortunately, the offspring of interbreeding do not display the vivid colors expected, and actually lose coloration. 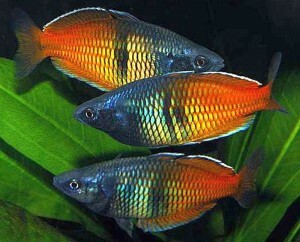 Keep the bloodlines pure when breeding rainbowfish of the Melanotaeniidae family. The Boeseman’s Rainbowfish are opportunistic feeders in the wild. They have a diet of insects, small crustaceans and vegetable matter. In an aquarium environment, they should be fed a high quality flake food with periodic feedings of live, frozen or freeze dried bloodworms, brine shrimp, tubifex, daphnia, etc. The Boeseman’s Rainbowfish is available in many tropical fish shops and online as the Bicolor Rainbowfish or Boesemani Rainbowfish. They are moderately priced and slightly more expensive than other species of rainbowfish and are generally sold as juveniles at a size of 1 3/4″ to 2 1/2″ in size.